New Code Geass Project Launch Green-Lit! Wait for more info in 2010!! The image adds that this project represents a "rebirth" and that Geass will take a new step starting today. The message is signed with the name, "ZERO." 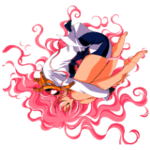 In the January 2009 issue of Gakken's Animedia magazine, the Sunrise anime studio indicated the possibility of more plans for its Code Geass science-fiction franchise. Sunrise created and animated the Code Geass: Lelouch of the Rebellion television anime series and its R2 sequel. Sunrise did not indicate the format that any hypothetical future plans might take. The Adult Swim television programming block ran Bandai Entertainment's adaptation of the R2 sequel in North America. Oh hell yes. I love everything Code Geass related, so I can't wait for this. Lots of speculation at the moment about the direction it'll take, because we all know how R2 ended . Definately looking forward to this. oh man, this literally bought tears of happiness to my eyes. Well that's one of the ideas, the other main one is that it's a series reset, possibly following one of the manga storylines. EDIT - second edit; first time I was here the image was ANN's "no hotlinking pictures" image. Does anyone else see it, or do they have the above image twice? Have you visited the ANN page linked in the first post? Then you clicked on the link, it loaded that image, and stored it in cache, which is why when you come back to this page, it shows the image, because your browser doesn't try to reload the image from the server, but instead loads it from the cache, hence the pic now showing. Yeah, I though was cache. Still, I'm hosting the image so people don't have to look at the non-image. So those crazies over the internet were right, huh, Code Geass returns. But will it succeed? Well as we have talked about over in the Season 3 thread, where it goes there are many possibilities, and the way people want it to go differs. "Rebirth", rebirth to what exactly? There series? The original storyline? Or rebirth of particular characters? I am sitting on the fence where I want it to go. If they can go back and just give us a glimpse of whether Lelouch is still alive or not, and stop there I would be happy. There is something inside me, despite the great ending the series had, that just wants me to see 30 more seconds. But the carry on after those 30 secconds, what happens after we see what we want to see? What's next? However, a complete re doing of the series the way it was intended to go would be awesome too. im just a little curious to know what you mean exactly by this statement, i havent seen the last half of R2 because i got to it and then realised madman would do the release for it so (even though i know the ending -.- ppl not useing spoiler tags), i just thought hey, id rather watch it on a big tv with good quality. so im just curious on this statement, please enlighten me? Well, It was stated in an interview with the director of Code Geass... They had to completely change their plans for R2 when its timeslot got moved (to appeal to a different audience and all). It was originally in the same timeslot as the first season, but got changed to a timeslot which was a different demographic. Ohhhh ok that wad what it was referring to. Does anyone know what episode the time slot changed? And in that case then i wouldn't mind seeing it be changes around to it being how it was ment to be, assumeing it led to a different ending, if it led to the same ending I wouldn't really see much point in re doing the intire season, it would probably come out as ovas or a movie. Not episode. The entire season. They had to change their plans for the ENTIRE season. So R2 was pretty much not how they planned the series to go. Some of the changes hinted at were pretty big, apprantly orenji was never meant to come back as a cyborg with geass canceling powers for one. The entire second season was redone, like Dr. Jackal said, it was done to appeal to a greater audience based on the good ratings of season 1. If you watch R2 you will notice almost every episode ends with a cliff hanger, it's very suspenseful, but some characters were in it that weren't meant to be. Have you every heard of Code Geass being a train wreck? Well that saying has comes from how fast the series moves, where it goes, and what happens - Despite being great all the same. Personally I don't see it as a train wreck, I think it's an awesome show, but there was an originally planned season 2 for the show, which I would like to see, and I am sure others too, the direction it heads towards. Think of it like FMA vs FMA: Brotherhood I guess, but within Code Geass - Code Geass vs Code Geass: Originally planned, but unseen. People want to watch how it was meant to go I guess. Hmmm I guess putting it like that it does make it sound alot more interesting, and wasn't aware of all of that. I would like to see a new ending or perhaps like Renton said a further few moments, or perhaps even an a what if this happened. No matter what happens I'll watch it and will more or less still like it. I think this news (quoted below - click on Faster Than Light for link) sounds a lot more interesting than a rebirth/reboot of the original. Honestly, the anime ended the Lelouch storyline perfectly. To follow on or try to rework it would be stupid, IMO. 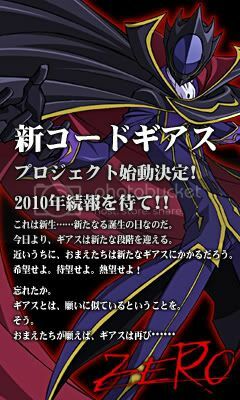 News from Japan - A new Code Geass series will be starting in 2010. Scripted by original series director Goro Taniguchi, this will be the first time he has scripted an entire manga (comic) story. Details at the moment indicate that the series will be called: Code Geass: Shikkoku no Renya. No official English name is provided. The story takes place in the Edo era. C.C. will be the only returning character, and a new lead name Renya will be the central focus of the story. More details to come when we can confirm. There is currently no English language release set for this new project. This is a great idea, I think. The geass has been around since forever, so there's plenty of potential for stories set in any number of time periods, which could open up the franchise to some really amazing stories instead of just rehashing the same Zero storyline over and over (as good as it is). before i start i would like to add the fact that i know very little about the world of gundam, so yer. anyways... so in relation to the quote, so could that leave to code geass being a potentialy new form of gundam, seeing as there is so many versions of gundam, could that mean there could be many addaptions of code geass? assumeing they all got the support. zeonezeonly - yeah, I guess it could turn into another Gundam with multiple stories being told. I'd like to think they could be a hell of a lot more consistent with Code Geass than they ever were with Gundam, but yeah, there's definitely potential to span thousands of years of history with stories, or go however far you'd like into the future. Like a lot of franchises, Gundam has become so convoluted, what with the whole splitting up of centuries/eras. Code Geass *could* tell a complete story across multiple series set across a whole number of time periods, and culminate in some far-future showdown with CC and the other immortals. Geass is supposed to be tied into very existence of humankind, remember. Well think of this, if Lelouch is not back, it further supports he is infact dead, which means he's in Cs world now, where Shirley would be, Lelouch and Shirley are together. Bandai Entertainment recently revealed one of their upcoming Code Geass projects in a form of two new manga anthologies: Code Geass: Lelouch of the Rebellion Knights and Code Geass: Lelouch of the Rebellion Queens. Code Geass Knights is the �official manga anthology for the girls� which is based on the male characters (Lelouch and Suzaku among other) of the Code Geass anime series while Code Geass. Not much, I know, and it's still continuing the Lelouch arc. arnt these of the adult nature though? I just think they're fan service-focused. Nothing too serious. Yay fan-service must order Code Geass: Lelouch of the Rebellion Queens need more C.C. Wonder if this is a risky purchase though, nah it's Code Geass this should be safe. That's what they want you to think . So is there any idea of a release date on these? Ok thanks, I may forget about it by then though . well i need to update my manga for code geass, so i will probably import them from TRSI and inform ppl how they are assumeing i remember that is. Sounds like an interesting side story. Glad they are not trying to continue the main story line... as it would make the last train wreck look good by comparasion most likely. Brief as it is, that sounds awesome. Good to see them expanding things. Hmm sounds like it could be very good . Hmm, new installment on the Code Geass anime, hm? I must admit, I'm kind of glad that they probably won't be telling us if Lelouch is alive or dead, because I'm afraid that they'll say he's alive. I didn't want him to die, but he did so in a spectacular way, and it was really how he 'should' have died, IMO. To bring him back now would cheapen that, for me. But I will be waiting for more information with great interest. Oh, [swears profusely]. I could have sworn I used spoiler tags! Sorry, fixing that one up right now. No worries. I don't think this part of the boards gets that much of an audience anyway.